WildVoice - Podcasting from the makers of WildVoice® Podcast Studio: How can I get WildVoice Studio? How can I get WildVoice Studio? WildVoice Studio is still available. You can check out the original WildVoice.com site or download it from the links below. to record podcasts and other audio. 1. Record your show in clips, mixing in music and sound effects as you talk. 2. Edit your clips, cutting out the parts you don’t like. 3. WildVoice Studio merges your clips. Publish the finished show on WildVoice.com (right from WildVoice Studio!) or any other site that supports audio files. Windows XP is required. 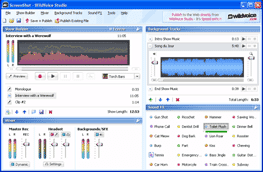 WildVoice Studio does not run on Vista or Windows 7. WildVoice Studio Setup will install Microsoft .NET Framework 2.0, if it's not already installed. Is there another way to download your program? The link does not work any more. I think the file hoster is having some technical issues today. Let's see if they come back in an hour or two. por favor, gostaria de saber como enviar os arquivos que eu criei, pois quando chega na etapa da gravação, para enviar, precisa de cadastro e eu não sei onde cadastrar-me. You can download it from cnet. I just did. That comment translates too: please like to know how to send the files that I created, when it arrives at the stage of recording, to send, you need to register and I do not know where to register me. The WildVoice web site is no longer functioning. So you cannot use the automatic publishing feature. You can however save the generated MP3 files on you own computer (look under MyDocuments\My WildVoice and upload the MP3 file to any web site you like. Please please make a version for Vista! Please, please make a version for Vista! Sorry, no luck for Vista, but there is some good news. WildVoice studio can run in Windows 7 using XP Mode. It will not recoed my voice? How can I fix this? You will not make new version for windows 7 or planning even to do new version for windows 7 ? Take a look at http://www.wildvoice.com/2009/02/will-there-be-version-of-wildvoice.html for an explanation. The short answer is no, we aren't making a new version. You guys have the absolute best software out there. There's nothing like it. I do a radio program and when I interview on skype it broadcasts crystal clear without having to download a bunch of other programs. I have to upgrade to Windows 7 now since xp updates are no longer available. :( would you please think about it? I would pay for that.